Thanks to Dr. David Cohen, Herzliya Medical Center (Israel) for contributing this case. To contribute a Case of the Week, follow the guidelines on our main Case of the Week page. (1) If you are starting a new job or fellowship, please send us your new email address so you can continue to receive our newsletters. (2) We recently posted a new article on our Management page, "Check Your Billing After A System Upgrade! ", by Angela Granlund, Vachette Pathology. We will post new articles as they are provided by Vachette Pathology and AdvantEdge Healthcare Solutions. 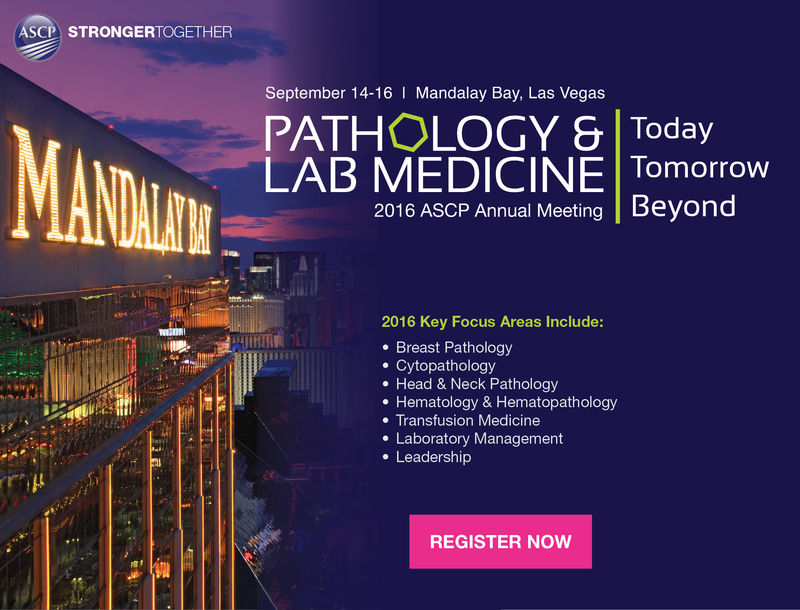 In addition, we posted some new CME being offered by ASCP, and Leica Biosystems posted a New Product Announcement. (3) We are now allowing Pathologists to submit interesting cases on our Facebook page, for comments by other pathologists. This should not replace a formal consult necessary for making a patient diagnosis. Please post up to 100 words of text and 3-5 images on our Facebook page. Comments must be relevant, polite and not offensive. We monitor this page, and remove posts / comments that don't meet these standards. A 57 year old woman with a 2.4 cm breast mass underwent a partial mastectomy. 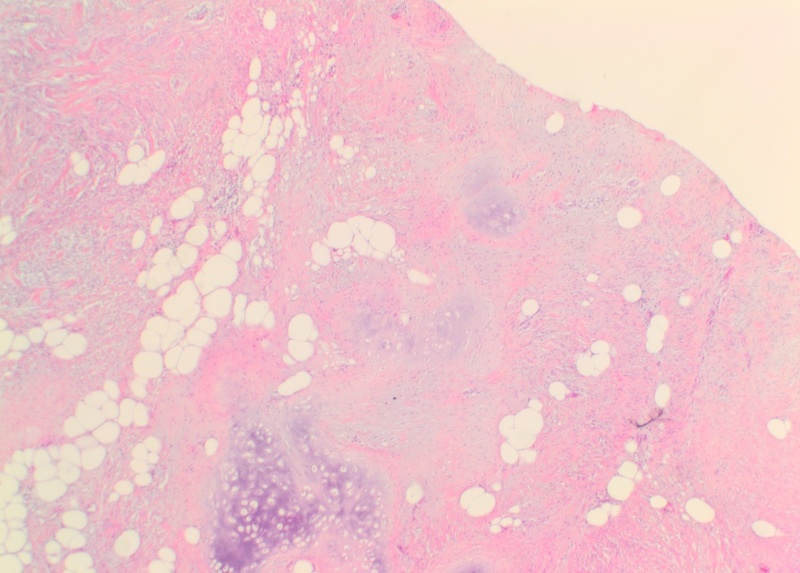 The specimen was a needle localized partial mastectomy with a 2.4 cm firm, grey-white, well circumscribed mass. The tumor cells were strongly positive for CD34, ER and PR. Mammary-type myofibroblastoma (MTMF) was originally described in the adult male breast, but has since been shown to occur throughout the body, in all age groups, and in both males and females. The majority of tumors are subcutaneous, but can be intramuscular or located within the abdomen, pelvis or retroperitoneum. 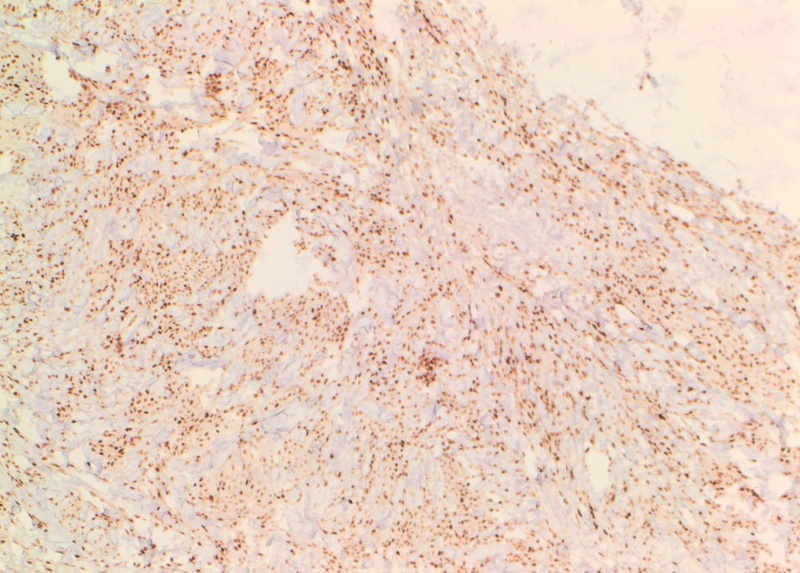 MTMF is a benign neoplasm that is molecularly related to spindle cell lipoma and cellular angiofibroma (all show aberrations of RB1 at 13q14). MTMF may be asymptomatic or cause a painless swelling or mass. There is an extremely low risk of recurrence, even if incompletely excised. Grossly, MTMF is well circumscribed with a whorled, rubbery or gelatinous consistency, and a yellow or gray cut surface (Goldblum: Enzinger and Weiss's Soft Tissue Tumors, 6th ed, 2013, Am J Surg Pathol 2016;40:361). 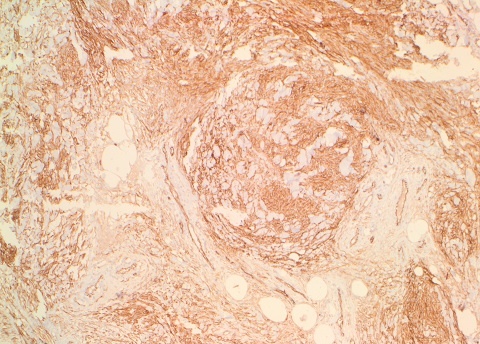 The conventional histologic appearance is of bland fibroblast-like spindle cells with relatively short, stubby nuclei. 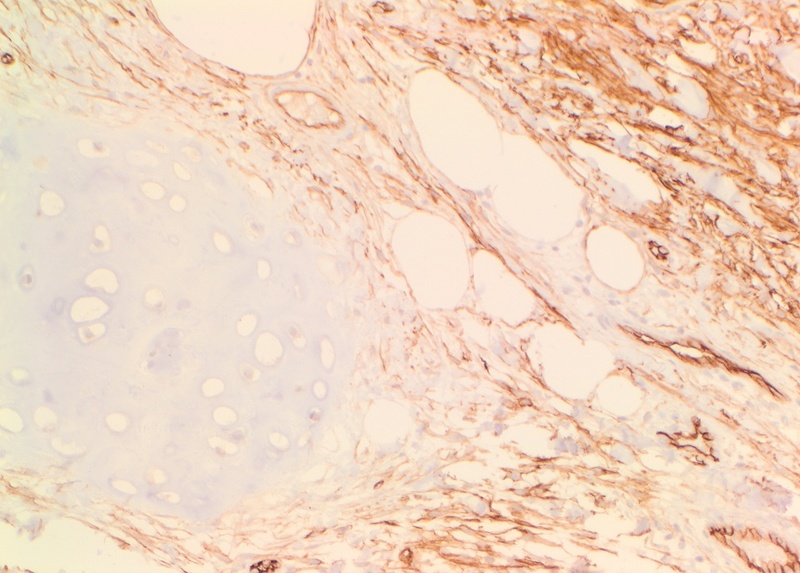 The cells are interspersed between collagen bundles and a variable amount of adipose tissue. The stroma can show hyalinization and / or myxoid change. Mast cells may be conspicuous (Goldblum: Enzinger and Weiss's Soft Tissue Tumors, 6th ed, 2013, Am J Surg Pathol 2016;40:361). Several different variants of MTMF have been described: cellular, infiltrating, collagenized / fibrous, lipomatous, myxoid, epithelioid and deciduoid-like. Areas of smooth muscle, bone and cartilage can be seen (Am J Surg Pathol 2009;33:1085). Rare tumors may show a neurilemmoma-like pattern. 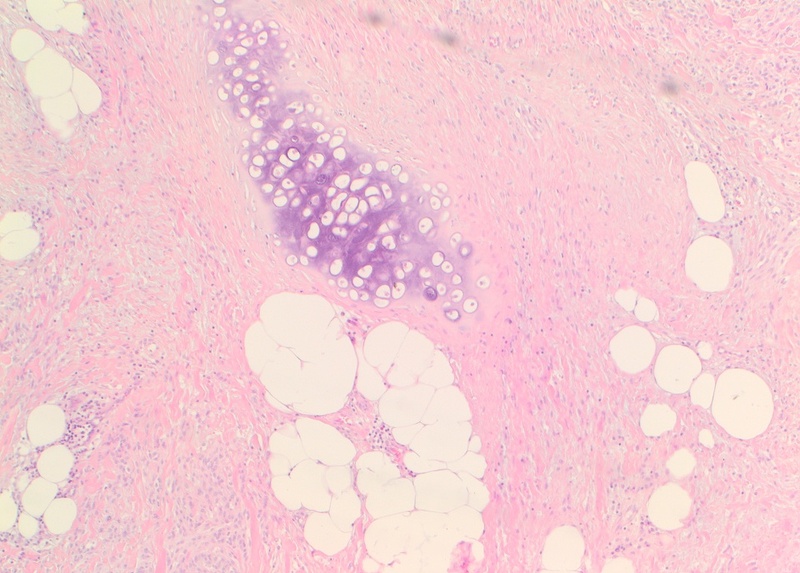 "Symplastic" or degenerative cytologic atypia - enlarged, hyperchromatic, multinucleated cells - can be present (Am J Surg Pathol 2016;40:361). MTMFs in the breast most commonly occur in postmenopausal women and older men (Goldblum: Enzinger and Weiss's Soft Tissue Tumors, 6th ed, 2013). 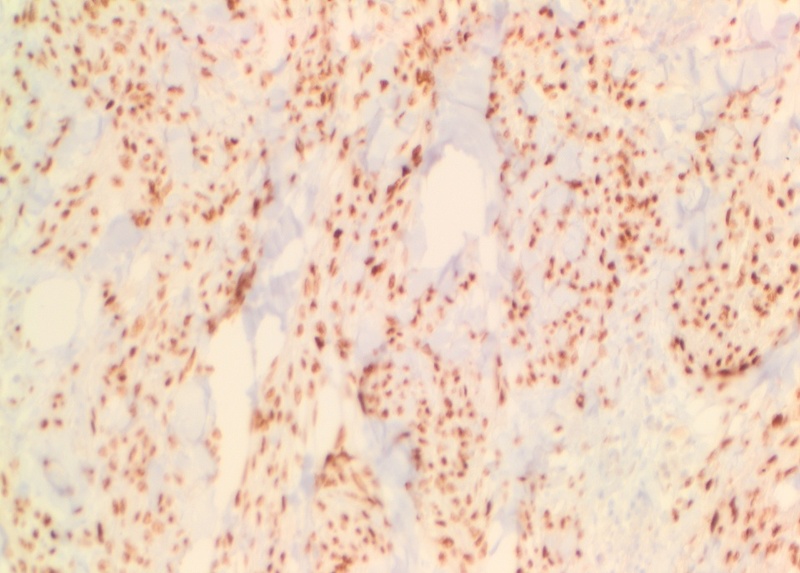 Of note: the epithelioid subtype of MTMF may be confused with invasive lobular carcinoma, as both can show epithelioid cells growing in single files in a fibro-fatty stroma. 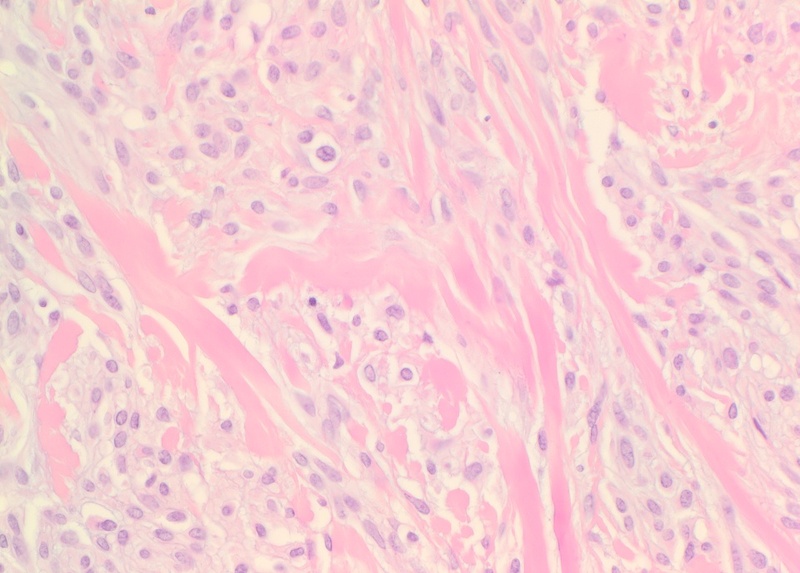 The diagnosis of epithelioid MTMF should be considered over carcinoma when the tumor has pushing borders, prominent collagen bundles, no entrapped glandular breast tissue, a low mitotic activity (< 2 mitoses per 10 hpf) and no atypical mitoses or necrosis, although these features may be difficult to assess on core needle biopsy. MTMF is typically positive for ER and PR (Am J Surg Pathol 2009;33:1085), but in contrast to carcinoma, is negative for keratin. In addition, MTMFs typically express CD34, desmin and CD10, and may express SMA and EMA. Typically S100, MDM2 and CDK4 are negative (Am J Surg Pathol 2016;40:361).